Yahiko Village is situated on the Sea of Japan side of the central part of Niigata Prefecture. Its western side borders Niigata City and Nagaoka City with sacred Mt. Yahiko (634 meters) in between. While Tsubame City neighbors the eastern and southern sides of the village, there is a fertile grain-growing region abutting Niigata City on the northern side. Legend has it that, in ancient times, Ame no Kagoyama no Mikoto – a great-grandson of Amaterasu Omikami – sailed across the Sea of Japan and landed at the Nozumi shore (modern-day Nagaoka City) on the western side of Mt. Yahiko. The god taught the local people to produce salt by boiling sea water and to catch fish by using nets and hooks. He then settled in Yahiko and established the industrial foundation of the region by providing know-how on agricultural and other industries. After the god left, seven generations of his offspring continued to contribute to forming the basis of the Echigo culture. The supreme shrine of Echigo Province, dedicated to Ame no Kagoyama no Mikoto, Yahiko Shrine, fondly referred to as “Oyahiko-sama,” has widely been adored and worshipped by the populace since the ancient Manyo era. This is why Yahiko Village is known as the birthplace of the Echigo culture. The village has prospered for many centuries as the temple town of Yahiko Shrine and a posting station on the Hokkoku-kaido Road. After the Meiji Restoration, the village was ruled by the Izumozaki government section until 1879 when it was incorporated into Nishikanbara County as part of township reform. On November 1, 1901, the former Yahiko Village, Sakuraigo Village and Yahagi Village were merged to establish a new village – Yahiko Village. Since then, the village has remained almost unchanged for more than 100 years. In recent years, the improving transportation network, combined with its convenient location, has made Yahiko Village increasingly accessible, attracting more people not only from within the prefecture but also from the Kanto and Kansai regions. 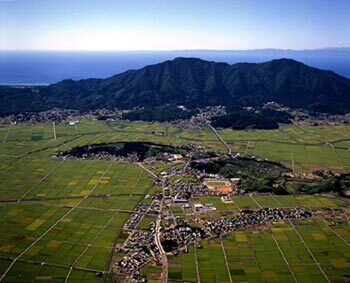 Yahiko Village is now one of the most renowned sightseeing destinations in Niigata Prefecture. As of 2005, the population of the village was 8,545, with 2,514 households. By building on its unique historic and cultural background, we intend to nurture the individuality of Yahiko Village to create and foster a well-balanced local community. The average temperature over the past five years has been 13.9°C. The average highest temperature is 36.5°C (recorded in 2006). Even in the winter, the temperature rarely drops below zero. 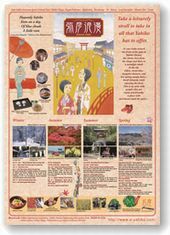 Located in a relatively warm region of Niigata Prefecture, the village enjoys a very mild climate compared to the regions along the mountains. While the rainfall is intense in the rainy season, the maximum precipitation for the year is occasionally recorded in September when many typhoons hit the region. Despite being in a prefecture where the number of snow days and the amount of snowfall are both high, Yahiko Village experiences relatively little snow. Copyright©2004 弥彦観光協会 All rights reserved.